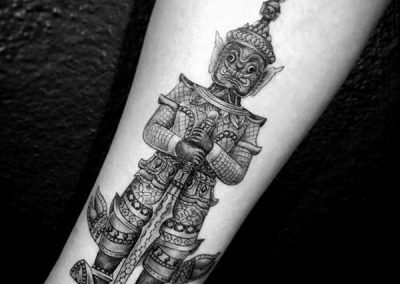 What are the different types of Thai tattoos? 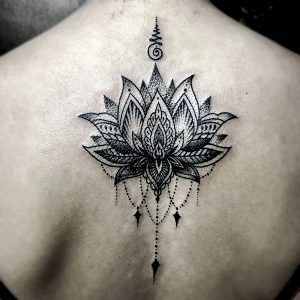 What are some of the most popular Thai inspired tattoo designs? 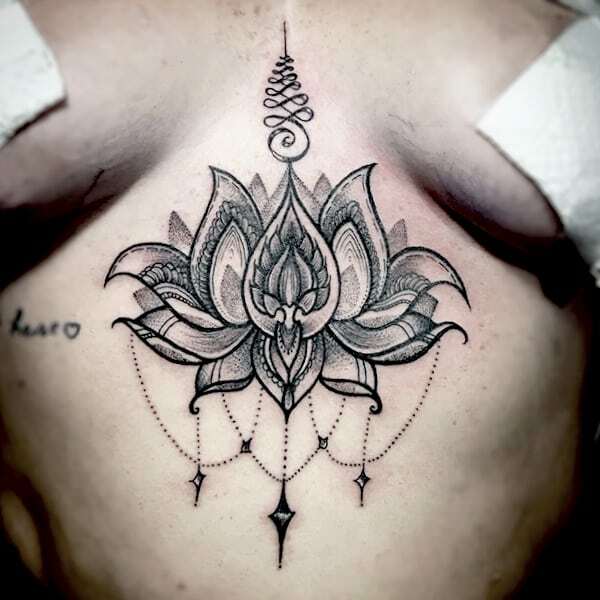 Why is the ALL DAY tattoo studio the right choice for you? Thailand – The Land of Smiles! Many visitors to the Kingdom quite rightly class a visit to the country as a holiday of a lifetime. You do not have to dig too deep to understand why. This huge, diverse country offers something for everyone; beautiful countryside, national parks that really do take you back to nature, glorious islands and beaches that range from busy and lively to completely remote and off the beaten track. Accommodation options from beach huts to 5-star luxury hotels means there is something to suit every pocket and the culinary delights blow many away. Whether you are looking for a totally chilled holiday or one where the party scene will surpass your expectations, Thailand has something for you. Taking the above into account it is little wonder that many who visit want something to remind them of their unforgettable experience. 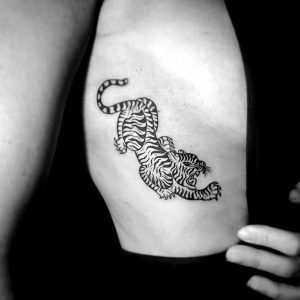 A perfect way to achieve this is by getting one of the many Thai holiday tattoos available. This will serve as a long-term reminder of a special or significant memory, either for you as an individual or as part of the group you have travelled with. From the days of the earliest explorers there has been a fascination to travel outside our boundaries. It was during these early years of exploration that ship’s captains and crews came into contact with different countries and their people. In turn they gradually began to understand the significance of tattoos for these nations and their tribes. Throughout the 20th century (1900’s) tattoos have had a chequered history in the West and it was not really until the 1970’s that tattoos really started to become mainstream, popular and have much less of a stigma attached to them. Their popularity has gradually increased and to this day many see receiving a tattoo as a rite of passage. It is now also commonplace to receive a Tattoo relating to a person’s travel adventures; Thai holiday tattoos being a point in case. Up until the 1970’s commercial travel to foreign countries was no mean feat and was generally restricted to those with a fair bit of time and money on their hands. 1914 – 1st ‘commercial passenger flight’ – Between St Petersburg and Tampa, Florida. The flight took around 20 minutes. The 2 cities are on opposite sides of Tampa Bay. It took 2 hours by Steamship, between 4 and 12 hours by rail and a journey around the bay via automobile took 20 hours! The flight cost $5 one way per person (around $100 in today’s money) and took just over 20 minutes to complete. While it was a limited enterprise (4 months) it was so popular during this period that tickets sold out in advance for those 16 weeks. 2007 – The SuperJumbo introduced: Airbus delivered their A380-800 to Singapore Airlines. This huge commercial transporter can hold 853 passengers for a single journey! It cannot be denied that there are an abundance of places to receive a tattoo while visiting Thailand. Temples, markets, backpacker areas, red light districts and even while relaxing on the beach are all possibilities, but surely, when making such an important decision you should consider hygiene, health, safety and the professionalism of the studio and artists involved. 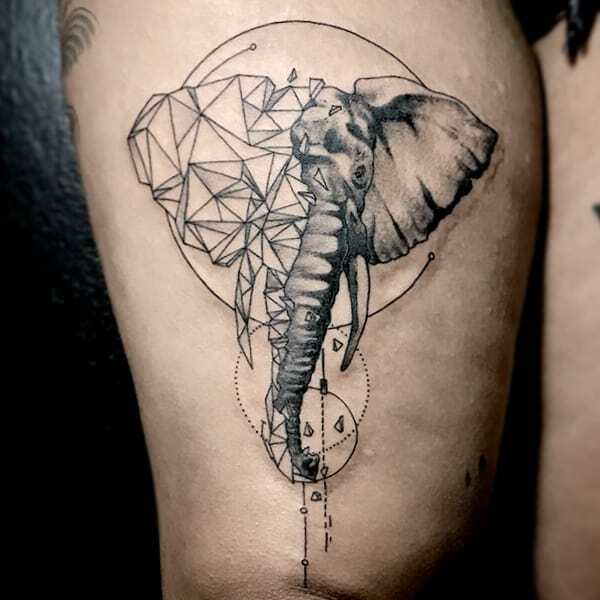 To this end there is little doubt that Bangkok is by far your best option, but only if you choose a reliable, reputable, licensed establishment such as the ALL DAY tattoo studio in central Sukhumvit. While foreigners refer to the capital city as “Bangkok”, Thai’s commonly call it by it’s abbreviated name: “Krung Thep” which translates to City of Angels. Bangkok is arguably the most vibrant capital city in South-East Asia and has something for everyone. Breathtaking sights, sounds, the array of food available and nightlife options to suit every taste mean a fun-packed time during a stay is yours. The country is world-renowned for its tattooing skills, but it is widely agreed that Bangkok is the best place to receive Thai holiday tattoos that will serve as a permanent memento of an unforgettable travel experience. 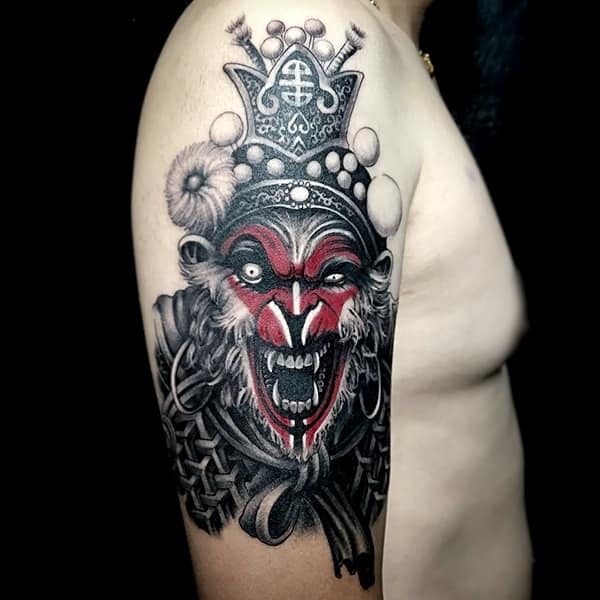 As just mentioned, Bangkok is undoubtedly the best place to get your Thai holiday tattoos and the #1 studio in the capital is the renowned ALL DAY tattoo studio which is located in the easily accessible, central Sukhumvit area. 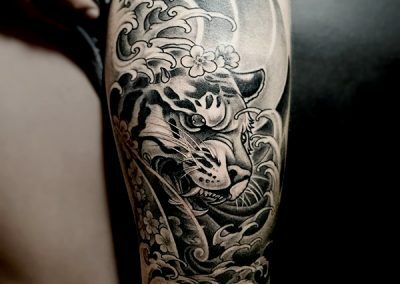 Later in the piece we will explain why the ALL DAY tattoo studio should be your ‘go to’ studio when considering Bangkok holiday tattoos, but first let’s take a look at the different types of Thai tattoos and some of the most popular designs visitors go for. One thing is for sure, those looking for Bangkok holiday tattoos will have no shortage of choice. Thai culture is extremely vibrant and diverse. This means there are designs for everyone. 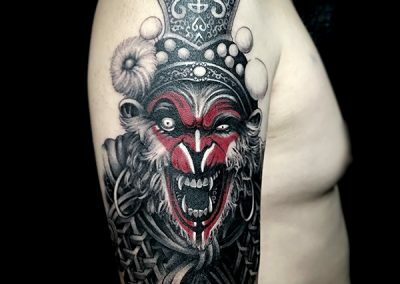 Many of the design suggestions mentioned later in the piece are referred to and completed in the style of Sak Yant tattooing. 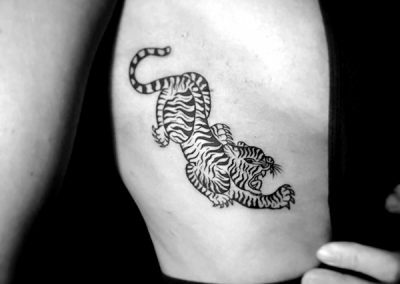 While this type of design is usually called a “Sak Yant” tattoo, they are also known as “Thai Traditional” or “Bamboo” tattoos. The Sak Yant practice is over 2,000 years old with its origin coming from Tai tribes located in Southwestern China and Northwest Vietnam and to this day such designs are packed with symbolism and intention. Accompanied with Pali Phrases which afford the bearer supposedly magical benefits. Examples being: Power, Protection, Fortune & Charisma. 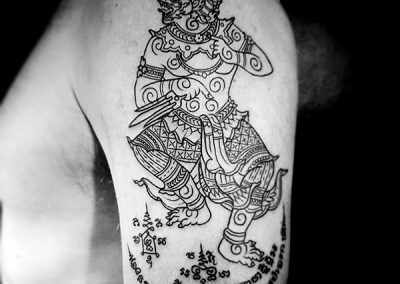 There is a very real belief amongst those looking for Sak Yant Thai holiday tattoos that the only way to achieve this is by receiving one from a temple specialising in the art. Please understand, this is not the case. 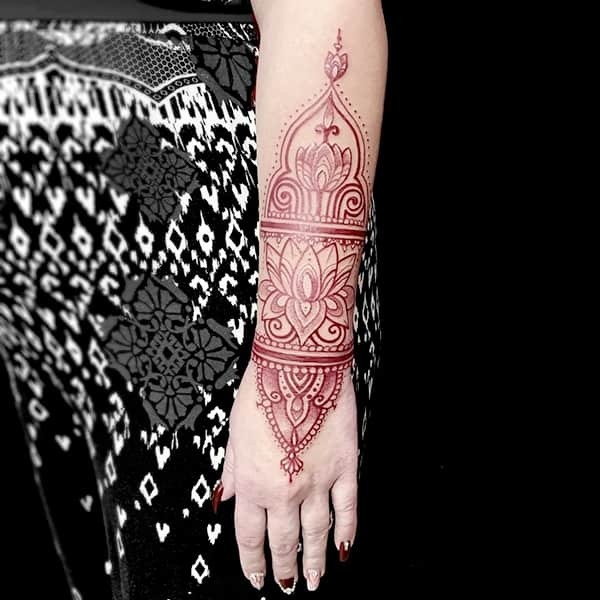 Sak Yant designs are stunning, meaningful pieces of body art that are perfectly acceptable to people of all Nationalities, religions and creeds. These designs can be received from a highly professional tattoo studio in far more conducive surroundings to that of a temple and still have a deep, personal meaning in relation to any Bangkok holiday tattoos you choose. The reality of going through the true, traditional process to receive a Sak Yant tattoo at a temple is simply not possible for the vast majority of westerners. This is because it would literally mean many years of deep, intensive training to learn and understand the complex mysteries and traditions behind these designs which are only then given to students based on achieved merit. Additionally, have a Sak Yant tattoo “blessed” in a studio or even a temple is not an authentic procedure. By their very nature a true “Ajarn” (teacher) is forbidden to receive money for tattooing. Such a “blessing” is merely pretending the receiver has earned their tattoo on the strength of dedication and merit. It is obvious that such practices are misleading. 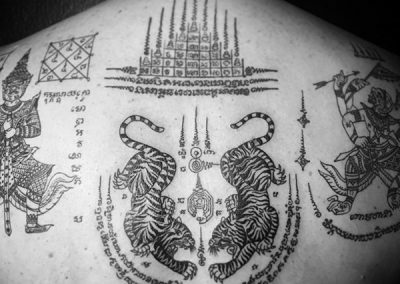 Receiving a Sak Yant design at a tattoo studio in Bangkok is completely acceptable from a Thai cultural perspective. Once received it will often be the case that Thai people are pleased to see you wearing a symbol of their rich culture. 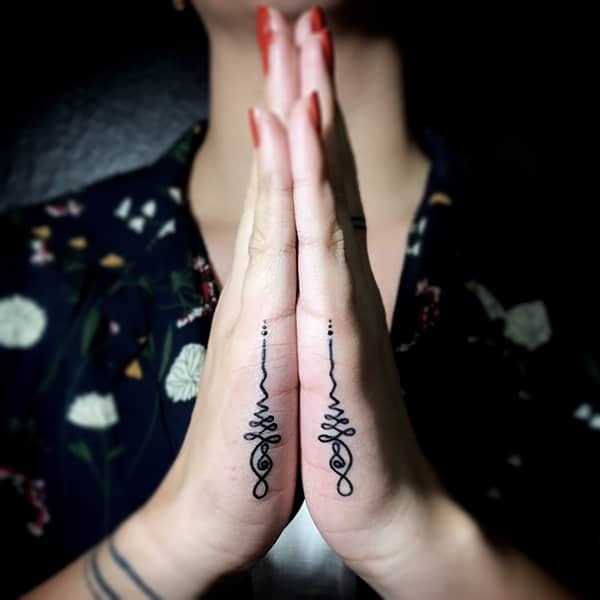 This should tell all who are looking for Sak Yant Thai holiday tattoos that there is absolutely no need to be duped by going through a false “magic” ceremony in order to enjoy your special Sak Yant design. 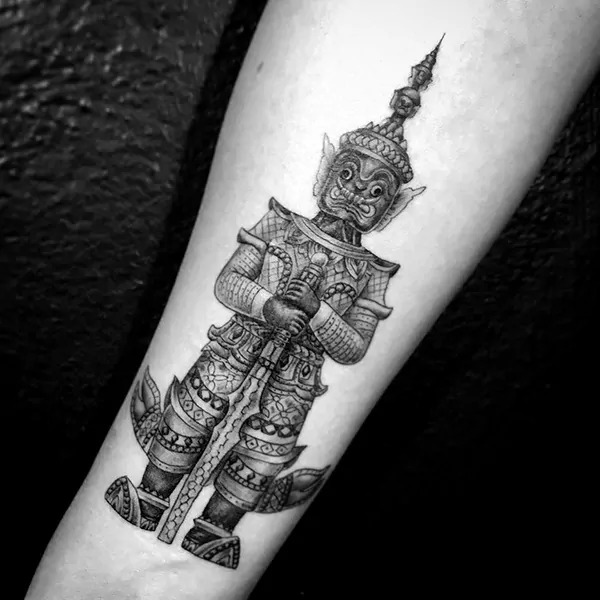 Special holiday memories, a certain location, or a memorable event that has particularly stayed with you during a visit are all excellent ways to decide on which of the many Thai holiday tattoos best suit your needs. There can surely be no right or wrong way to choose a design that will serve as a permanent reminder of your time spent in Thailand. Having said that, seeking advice from the professional, highly experienced ALL DAY team will go a long way to ensuring your expectations are exceeded. 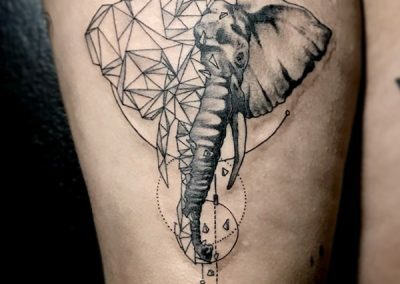 Our friendly, knowledgeable team of managers and artists are ready to add that extra “something special” to whatever Bangkok holiday tattoos ideas you may have. 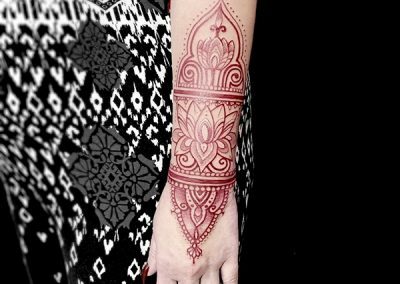 We will offer artistic advice based on our long experience of providing clients with Bangkok holiday tattoos to be proud of. This could be something as simple as an extra splash of color, a unique take on a common theme, or a completely different design from the norm. We will also give insight into where such Thai holiday tattoos will best fit on your body. Thailand is synonymous with elephants, indeed, they are the country’s national animal and are highly respected and revered by Thai people throughout the country. There are a variety of reasons why this impressive animal was chosen as the Kingdom’s national symbol, but a key factor is that Thai’s celebrate the elephant’s incredible strength, durability and it’s longevity. In Buddhist culture the unalome symbol depicts the path to enlightenment. 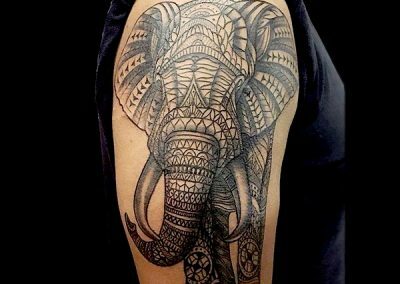 These tattoo designs can be large or small. The spirals symbolise life’s twists and turns, while the straight lines are there to indicate when the wearer reaches either enlightenment or peace & harmony. 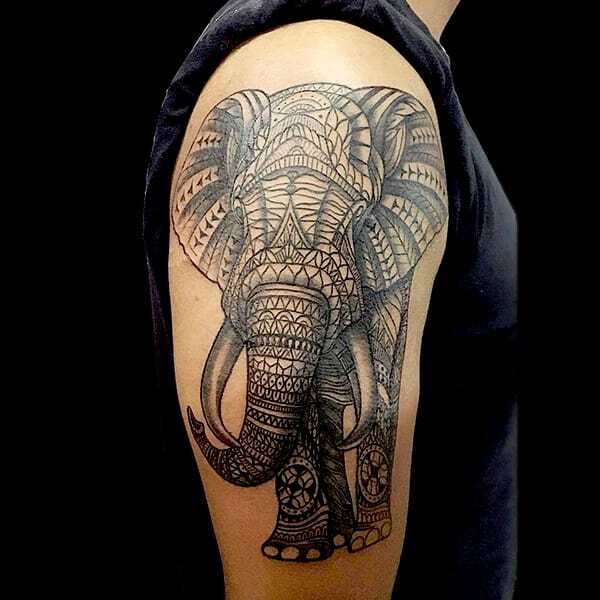 In terms of Bangkok holiday tattoos, this type of design can have a very significant meaning, particularly for those who embrace the spiritual feel of this majestic country. 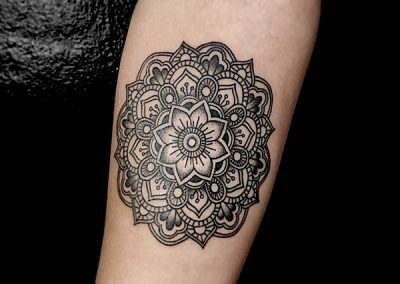 A Mandala tattoo is seen as a sacred symbol. 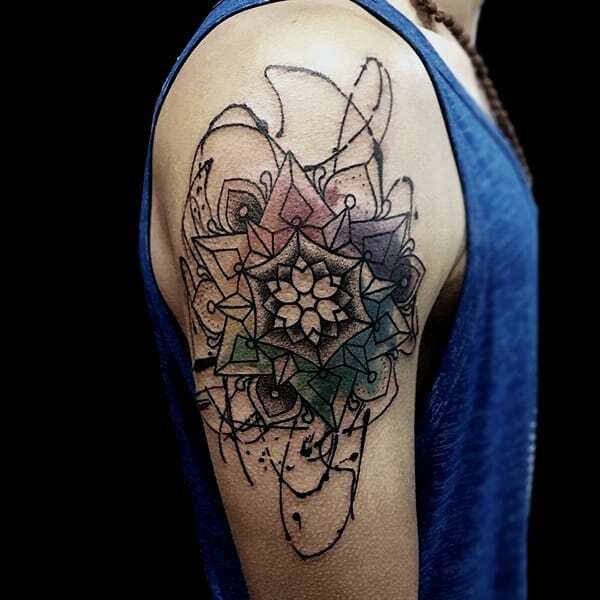 This type of tattoo design represents the Sun, the Stars and the Universe. 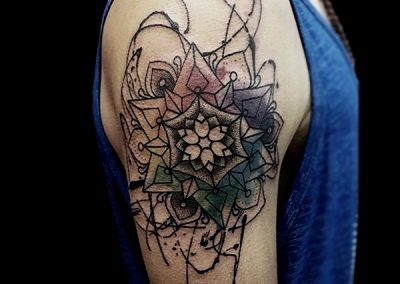 Those looking for Bangkok holiday tattoos to remind them of their time in the Kingdom will have a constant reminder of the sun-filled days spent here, the clarity of stars in the clear night sky and indeed, the beauty of the Universe. The Lotus flower has a deep, significant place in Thai culture and the different colors each have different meanings. You can opt for a highly stylized design with coloring in: Blue, White, Purple, Pink or Red. 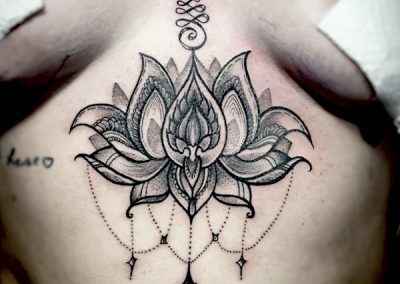 With regard to which Lotus design to go for in terms of Bangkok holiday tattoos, and the one that best reflects your experience in the Kingdom, the choice is certainly yours, but the ALL DAY team of highly skilled artists will be happy to explain exactly what each color means in order for you to choose a design that is right for you. Red Lotus: The red lotus relates to the heart. It is associated with love and compassion. Let’s face it, a visit to the country’s teeming metropolis makes a Tuk Tuk ride a must! One thing is for sure; it is an experience that will not easily be forgotten! 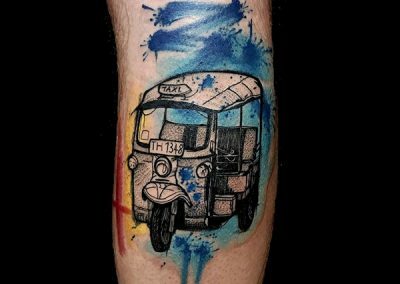 Many people looking for Bangkok holiday tattoos that will serve as a reminder of their time spent in this chaotic, surprising and mesmerising capital opt to have a Tuk Tuk inking. These fun, vibrant depictions will serve as an excellent memory. 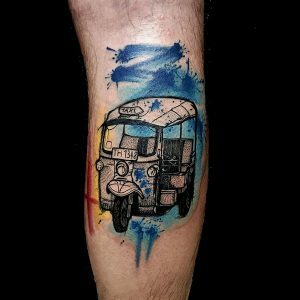 It will be a reminder of those hair-raising rides as well as the simple memory of seeing so many Tuk Tuks lining up at traffic lights and junctions while vying for the best escape route! For many visiting the Kingdom, visits to Thai temples are a truly memorable and significant part of their trip. There are countless majestic, calm and inspiring temples throughout the country. 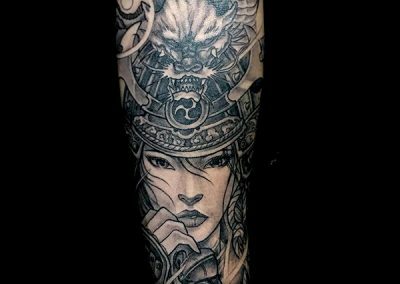 An ideal way to remember these experiences is by opting for Thai holiday tattoos depicting the intricate temple guardians, or an ornate depiction of the various temple designs offering real character. While there are countless examples to choose from, one which is not recommended is a Garuda design. 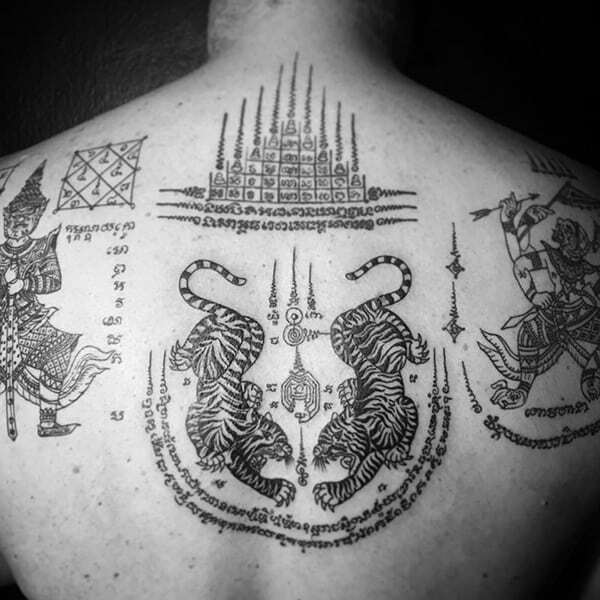 This design has been seen as a symbol of Royalty for centuries in Thailand and out of respect for the Royal family as well as Thai Buddhists everywhere we feel it is inappropriate to have such designs etched on your body. Having a word, phrase or name inked is an excellent way for Thai holiday tattoos to remind individuals or groups of time spent in the Kingdom. For couples travelling together this could have a special, romantic meaning, groups can remember the highly enjoyable time spent visiting certain parts of the country together and individuals can have a phrase inked that will always remind them of one special spot or occassion. The scope for receiving these Bangkok holiday tattoos is huge, but do remember to make sure the Thai writing relates accurately to your desired translation. There have been many cases where people have had words written as body art in Thai that do not relate to what was intended. 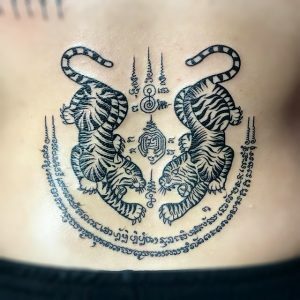 On this point, receiving a word, phrase or name in Thai script from the experienced professional team of artists at the ALL DAY tattoo studio is something you can be 100% confident in. Our friendly, knowledgeable team of managers and artists are multi-lingual and as such will ensure that the words you want are the words you will get! 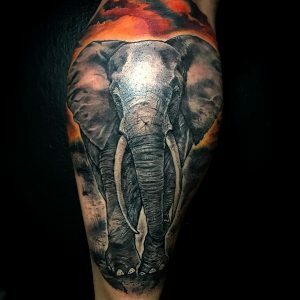 We have already mentioned that Elephant tattoos are an excellent memento when it comes to Thai holiday tattoos, but it should not be forgotten that there are many other creatures which will make for a perfect reminder of your time spent in Thailand. 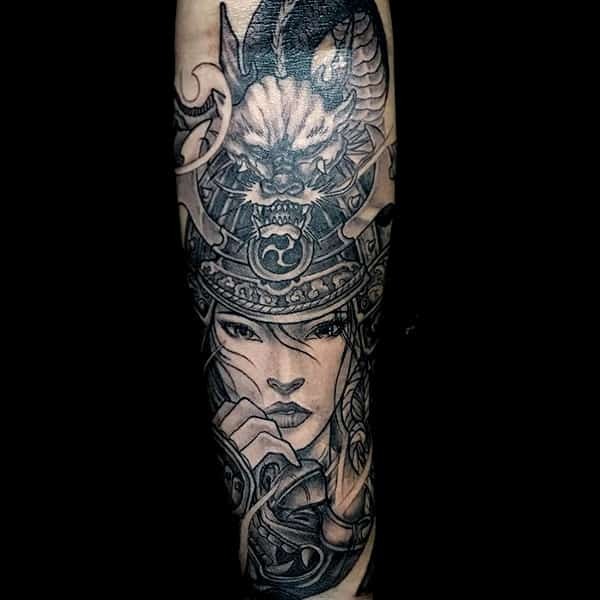 By choosing the ALL DAY tattoo studio in central Sukhumvit, Bangkok for your inking you can rest assured that we will answer each and every query you have. 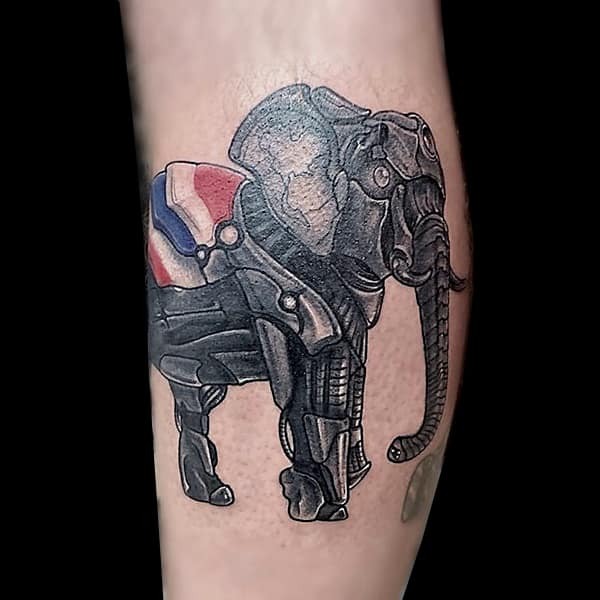 Our mission is to provide you with Bangkok holiday tattoos that you will be proud to wear; designs that will bring a smile to your face each and every time you take an admiring view. 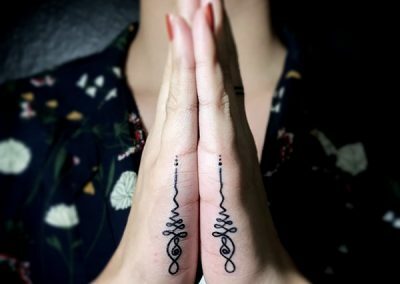 To help you realise your dream of receiving one of the countless Thai holiday tattoos available, here are just 3 important tips to help you along. Your design can and should be whatever you feel is most appropriate and one that relates best to your time in Thailand – Don’t hesitate to think outside the box – The ALL DAY studio team of fluent English speaking staff can certainly assist on this one! 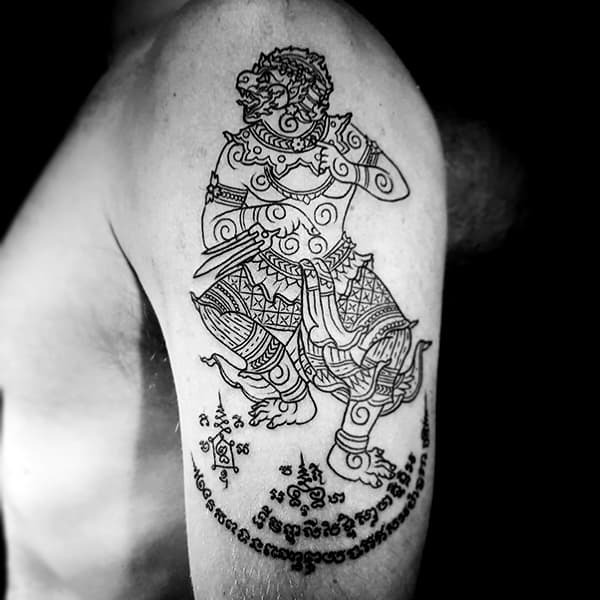 Do not feel that you need to attend a temple ceremony in order to acquire and have the right of wearing a Sak Yant tattoo. 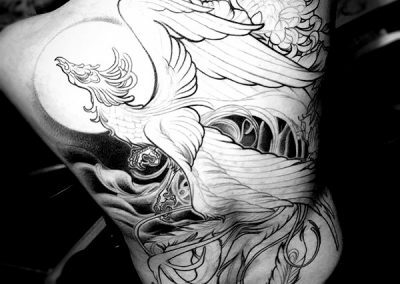 Do make sure that you go to a professional, licensed and fully competent tattoo studio to receive your design. 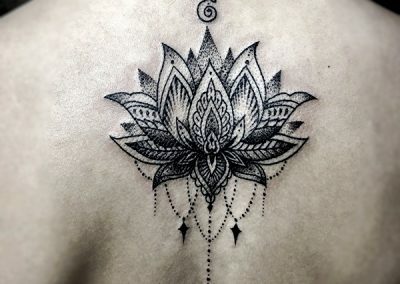 There is no doubt that Thai holiday tattoos can be received in many places, but when making such an important decision you deserve the best. 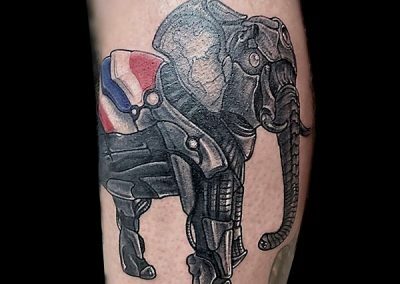 Does the tattoo studio hold a Thai government licence? Does the studio offer a clean, refreshing, cool environment? Do they conform to the highest of western hygiene standards? Are ALL inks and needles imported from the USA? Are ALL needles ‘one use’ only? Does the studio have native English speaking managers? Will you receive advice and guidance as to what design is best for you, not what is the most expensive? Are the artists highly experienced, professional and comprehensively innovative? Will you have that all-important peace of mind? 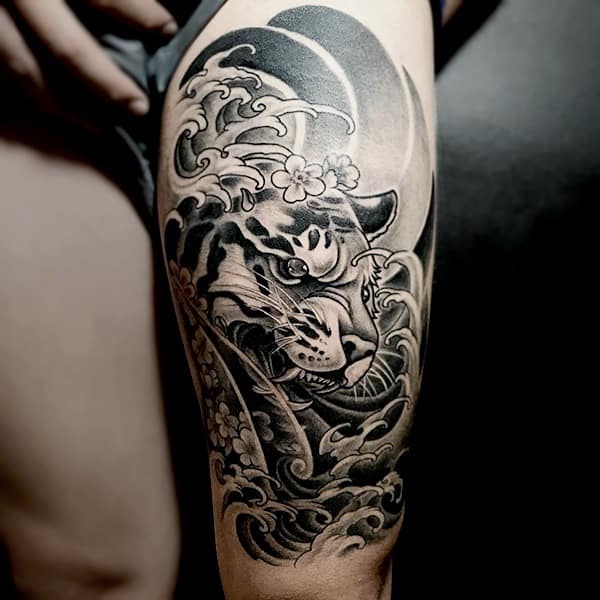 The managers and artists at ALL DAY tattoo studio in Sukhumvit, central Bangkok can answer a very positive YES, to all of the above and more. 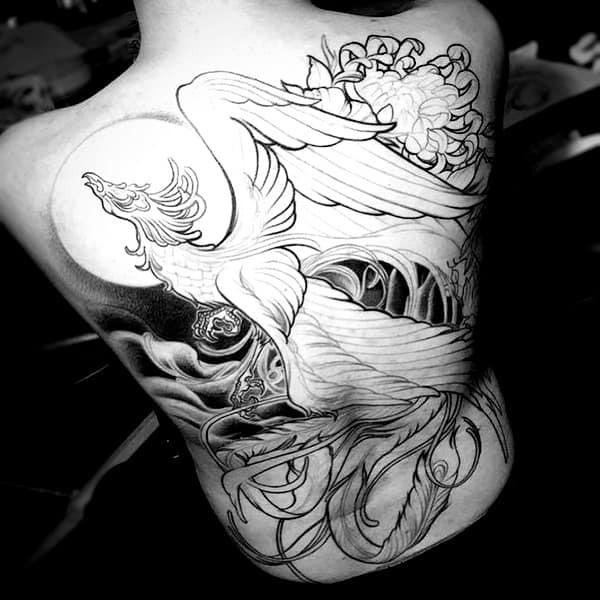 That is why we are consistently ranked as the biggest and best tattoo studio in Bangkok. 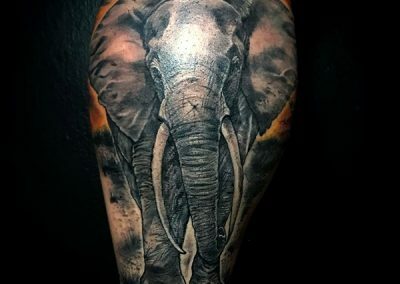 To find out what our highly knowledgeable, professional and friendly team can offer when it comes to deciding on those memorable Bangkok holiday tattoos please come along to our ALL DAY Tattoo studio in Sukhumvit for a chat. Better still, why not contact our fluent English speaking team by using one of the methods below. 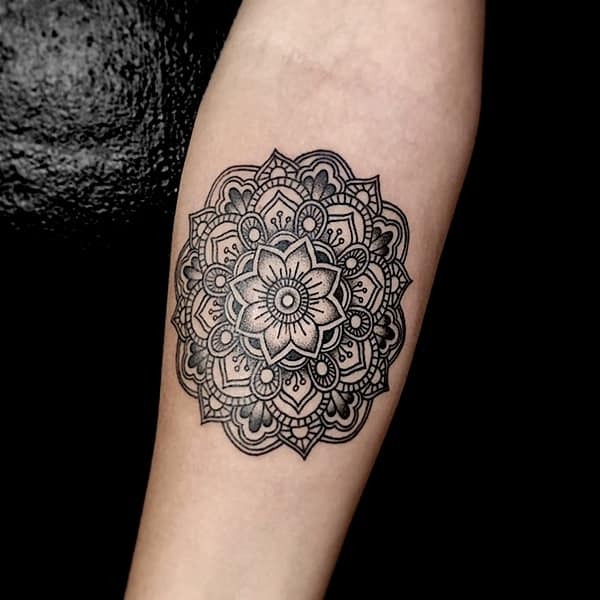 This will allow us to schedule a no obligation discussion that best suits you while discussing your ideas on those Thai holiday tattoos which will surely be cherished for a lifetime.